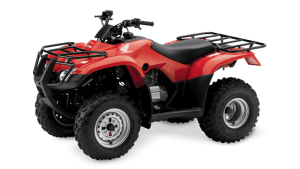 TRX420FE: Switchable 2/4wd – 5 forward/1 reverse gear, auto clutch with electric shift. 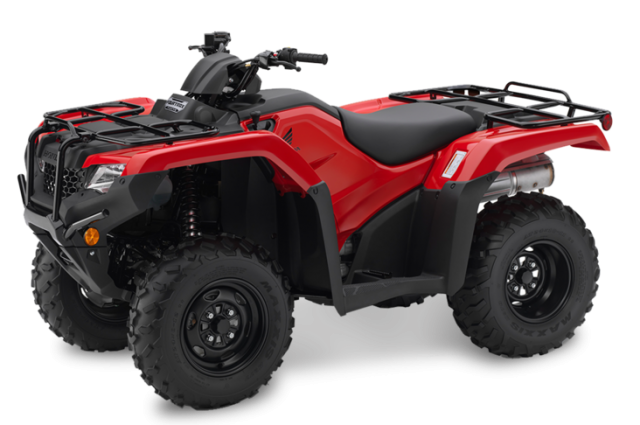 The TRX420 is built with all the quality, reliability and advanced features expected of a Honda ATV. 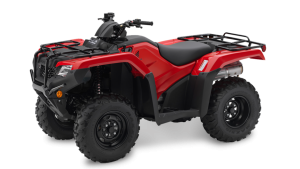 A choice of transmission models means there’s always a TRX420 to suit your needs. 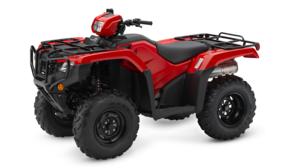 Electric Shift Program (ESP) adds effortless handlebar-mounted push-button gear changes. It a big plus when you’re wearing heavy duty work gear or riding in muck or snow. With dual discs and hydraulic calipers up front and a rear sealed mechanical drum brake there’s plenty of stopping power. An easy to use parking brake locks the 420 in position. Large fuel tank: With reserve – allows you to go long distances without having to refill. Air filter: Large 7.2-litre airbox and a washable/reusable foam air filter provide increased airflow to the engine, for increased performance and easy maintenance. Air-intake system: Snorkel-type air-intake system is specially designed to resist water ingestion. Cargo racks: Steel cargo racks front and rear haul loads of 30kg and 60kg respectively. Trailer hitch: Axle-mounted, heavy-duty trailer hitch with 385kg towing capacity. Floorboards: Unique floorboards allow the rider’s feet to grip the footrests while keeping away from mud and debris. Headlights: Twin-headlights with 30-Watt bulbs feature multi-reflector lenses.